The Los Angeles County Metropolitan Transportation Authority (Metro) is hosting four community meetings to get community feedback about future rail service, including the proposed extension of the Crenshaw/LAX Northern light-rail line through West Hollywood. Meetings in locations near West Hollywood include one on Thursday at 6 p.m. at the Westside Jewish Community Center, 5870 W. Olympic Blvd. in Los Angeles. There also will be a community meeting from 10 a.m. to noon on Saturday at Virginia Road Elementary School, 2925 Virginia Rd., in Los Angeles. On March 26 there will be a meeting at the United Teachers union headquarters at 3303 Wilshire Blvd., in Los Angeles from 6 to 8 p.m. And on March 28 there will be a meeting at the West Hollywood Library Community Meeting Room, 625 N. San Vicente Blvd., from 6 to 8 p.m. Under discussion will be key destinations, community concerns, design considerations and potential routes. 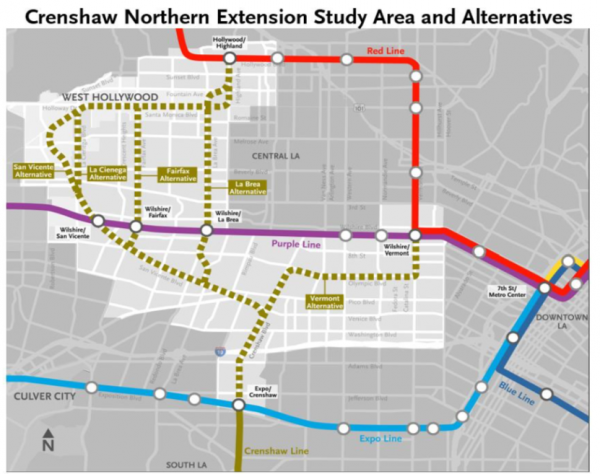 The City of West Hollywood has been working to build support for the Crenshaw/LAX Northern Extension light-rail transit line, which would provide north-south connections and enhance the existing Metro regional rail network. The city is working with Metro and the City of Los Angeles to accelerate the project from a scheduled opening in 2047 to as early as 2028. Those interested in updates on the city’s efforts can sign onto a mailing list from West Hollywood Advocates for Metro Rail (WHAM). More information about the project i available online at www.weho.org/rail. Congestion relief is desperately needed in West Hollywood now, and will be even more so once the current slate of building along SMB is completed (and likely much more to come). WeHo has obviously embarked on a path of urban density, like it or not. The worst scenario would be half committed to this plan, getting the congestion causing density without the transportation plan to deal with it. I believe the San Vicente route would provide the most benefit, especially if redevelopment of the bus depot were incorporated into the plan… West Hollywood Civic and Performing Arts Center perhaps. The city should push for this route even if it would entail at-grade rails up San Vicente. Let’s not have the ideal be the enemy of the good. The less money required, the more impactful an affordable contribution from our city will be and the more likely to accelerate the timeline. By the time this rail goes in, West Hollywood Park will have long been completed. Surely with all the new open space that will provide, the Pride festival can thrive even with a loss of San Vicente. Think of the benefit to Pride goers of being able to jump on rail transit just outside the festival, bypassing the nightmares of Pride weekend traffic and encouraging a non-driving option after a day or night of partying. Not to mention benefits to the city the other 362 days of the year. If the route is up N. La Brea Ave. or Fairfax Ave., I believe that will be the least disruptive and most beneficial in a cost/benefit analysis for the residents living in West Hollywood. I prefer the N. La Brea Ave. option. Thanks, no one has really given us an estimate of the time it would take for construction from San Vicente or La Cienega to La Brea or talked about how that might impact business. The routes you have suggested may give us enhanced Metro access with less disruption while being cost effective.